Hosts Steve Krige from La Baracca, Brad Rickard from The Loft and Kevin Porter from LaVida Bar & Restaurant will be welcoming diners to their venues as part of the Eat the Street progressive 'mystery' dinner for Eat The Street. ONE of several new ticketed events being held as part of Eat the Street 2018 is a progressive 'mystery' dinner on Thursday, 8 March, taking in five exceptional Lismore restaurants. Participants will be treated to a sumptuous night of food and drink, with a rolling five-course dinner that includes stops at the Lismore Workers Club, LaVida Bar & Restaurant, Miss Lizzie's, La Baracca and The Loft. Diners will be chauffeured from restaurant to restaurant and some of Lismore's most acclaimed chefs will serve up their finest culinary creations to delight and inspire. 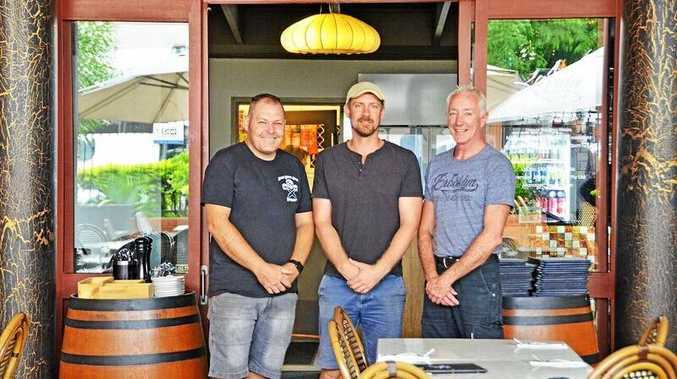 "Each restaurant will offer their most impressive dishes for our progressive dinner diners," Lismore City Council Tourism and Events Manager Mitch Lowe said. "Each course will come complete with a signature dish accompanied by a beverage that complements the food. It's a roving degustation of Lismore's finest eateries and the perfect evening for anyone who loves culinary adventure." The dinner will run from 5.30-9.30pm and tickets are $130 per person. Bookings can be made at www.eatthestreetlismore.com.au. The progressive mystery dinner is one of several new ticketed events happening in concert with the annual Eat the Street food festival on Saturday, 10 March. Other events include an Eat the Street Farm Gate Tour on Friday, 9 March, culminating in a long lunch at the Eltham Valley Pantry, and two masterclasses with award-winning guest chef Luca Ciano on Saturday, 10 March. There are also Foost Cooking Classes for young children running throughout the Eat the Street festival for just $12 per class. For more information or bookings, visit www.eatthestreetlismore.com.au.